This rolling greenhouse has come in very handy! There is a vinyl zip around cover that has kept the seedlings quite toasty. It's more like a test run this year. 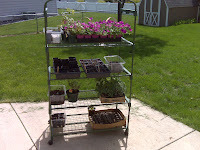 There are several herbs starting from seed as well as flowers from last years garden. I purchased some tomato seedlings as well as thyme and lemon verbena so just working on hardening them off and they'll go in this week. The old timers say to plant your garden when there is no snow on Crow Peak. There are a few very small patches up there so with the nice weather this week, I should be ready. Don has started a garden in the backyard. So far we have radishes, carrots, green bell peppers, tomatoes, and 80 day corn. He is very proud of himself. I feel like if "The Big One" hits, at least we'll have produce. Eat, drink and shop local when you can. Why not? It does everyone good. I'm always up for learning something new and deeply appreciate living in the glorious Black Hills. I believe we are all put on the earth to make an impact. Good or bad; that's our choice. My vote is for good! Glad you stopped by.